With winter weather hitting hard, keeping safe and staying warm are top priorities. Image Credit: Casey Staff. With winter weather hitting hard, keeping safe and staying warm are top priorities. Photography: Casey Staff. 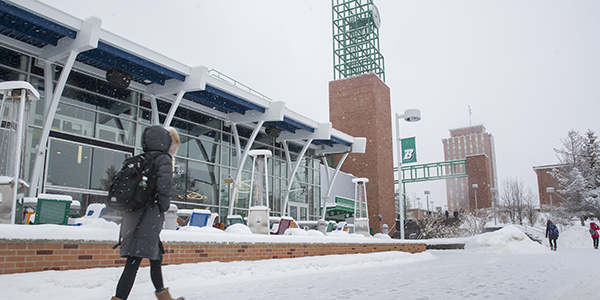 Winter has made its inevitable return to Binghamton, and now we’re in the heart of it. With storms that dump a foot of snow overnight, below-freezing temperatures and difficult driving conditions, staying safe and warm during the long haul that is winter can be challenging. However, with some helpful tips you can properly prepare yourself to brave the cold weather still to come. Staying informed about the daily weather is a great starting point, and with so many resources available, such as TV, radio, the internet and mobile apps, being informed is easier than ever. An inner layer made of wool, silk or polypropylene to hold body heat. An insulation layer of natural fibers like wool or goose down, or a classic fleece. An outer layer made of a tightly woven material, preferably water and wind resistant. Choose boots or shoes with good traction to prevent slips and falls. Stay dry. Wet or damp clothing accelerates loss of body heat. Remove layers if you begin sweating excessively. Frostbite can result in loss of feeling or color of the face, fingers and toes. You may also experience numbness, pale or gray-yellowish skin, or firm, waxy skin. To treat frostbite, seek a warm room indoors and soak in warm water. Do not massage or use heating pads to warm up. Signs of hypothermia include shivering, exhaustion, confusion, fumbling hands, memory loss, slurred speech or drowsiness. If you or someone else becomes hypothermic, get to a warm location immediately. Warm the center of the body first − head, neck, chest and groin − before extremities. Keep dry and remain wrapped in warm blankets until body temperature rises to normal levels. A battery-powered cell phone charger. Extra food and water. Stock up on high-caloric foods such as nuts, trail mix, dried fruit and granola bars, as well as foods that don’t require cooking. First aid kit and any necessary medications. Battery-powered NOAA Weather Radio or portable radio to hear weather updates. Bottom line, when it comes to enduring the wrath of winter, being prepared for any situation is your best bet. If you want to be informed of winter weather alerts in the area, sign up online to receive notifications. You should also remember to keep your gas tank near full, winterize your vehicle appropriately and regularly check maintenance. Driving in the winter can be treacherous. Be aware that everything takes longer on snow-covered roads, from accelerating to driving to turning and stopping. Go slow and start braking well before you need to stop. Braking with the ball of your foot and applying a firm, steady pressure to the pedal is the best way to stop without skidding. Additional driving tips include maintaining a following distance of eight to 10 seconds to allow extra reaction time and not coming to a complete stop while ascending hills to avoid getting stuck on icy or snow-covered roads. Staying off the roads is always the safest option. Unless it’s absolutely necessary, remain indoors until roads are cleared and the weather passes. You may be confident in your winter-weather driving abilities, but other people may not drive as well. If you must go out, use caution and allot plenty of time to reach your destination.